A carport full of birds can wreak havoc on your car. Contrary to popular belief, it isn't the acid in bird poop that causes damage to your car's paint. When a bird does its business on your vehicle in warm weather, the poop hardens in the heat of the day. At the same time, the paint on your car softens, expands and molds itself around the hardened poo. When the day cools off, the paint gets hard again but the bird-poop texture remains. Aside from hosing down the car every evening before the sun goes down, the only alternative to solving the problem of birds in the carport is to get rid of the birds. 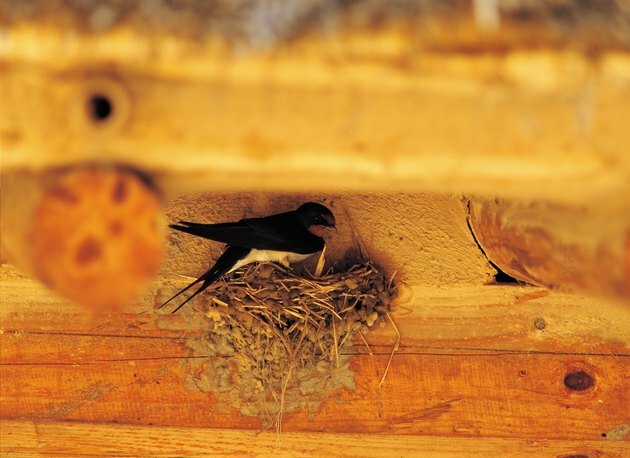 A carport is a sanctuary for nesting birds, offering protection from weather and predators. Survey your carport for the selling points that make it attractive real estate for birds. If your structure is constantly inundated by blown plant matter which harbors food for birds, used as a storage area for pet food or an insect magnet for whatever reason, conduct a thorough cleaning of the structure to rid it of anything a bird might care to eat. Remove all dead leaves and dirt from the floors and rafters. Vacuum spider webs and cobwebs and seal pet food and any other such temptations in a tub with a tight-fitting lid. Go to your local hardware store and purchase some bird netting or porcupine wires if the birds still flock to your carport. Bird netting is a fine mesh made from polypropylene. Nail or staple it across the entire ceiling of your structure to prevent birds from getting to the rafters. Porcupine wire, also known as bird spikes, consists of long strips of needles protruding in all directions. Screw these down along rafters and other places to which birds might be drawn to prevent them from landing. Depending on your structure and your preferences, either of these products are effective for bird control. Apply methyl anthranilate to the surfaces in which birds perch if you prefer not to attach physical barriers to your carport. Developed with the help of the United States Department of Agriculture, methyl antrhanilate is a food-grade substance that is derived from grapes. Available at many garden supply stores, it is nontoxic and environmentally friendly, and while it has a pleasant grape smell to the human nose, birds despise it. Methyl anthranilate is applied with a sprayer every couple of weeks; as an added benefit, it also prevents paper wasps from building colonies. Purchase a bird sound device if you prefer to avoid any physical or chemical bird barriers. Bird sound devices run on batteries or electricity and play sounds of birds in distress at a variety of volumes and frequencies so birds don't become inured to the sounds. While humans hear pleasant bird calls, birds hear other birds in danger and stay away.